Hit your ball farther without changing your driver! Now, you can launch your drives without resistance or deflection and gain up to 7 additional yards without changing equipment. The innovative Brush-T allows you to tee your ball on flexible synthetic bristles that bend on impact, creating a feel of driving the ball off the air. Hit your ball farther without changing your driver! Now, you can launch your drives without resistance or deflection and gain up to 7 additional yards without changing equipment. The innovative Brush-T allows you to tee your ball on flexible synthetic bristles that bend on impact, creating a feel of driving the ball off the air. These bristles provide significantly less resistance which produces dramatically longer and straighter drives. The Brush-t reduces resistance ordinarily encountered at the point of impact, and restores that stolen velocity, allowing the ball to travel the maximum distance possible. Independent testing has proven that golfers can gain up to 7 additional yards off the tee. Hit your ball straighter without changing anything but your tee! With Brush-t, golfers of all levels can hit longer, straighter drives off the tee without having to buy expensive new equipment. The unique qualities of the Brush-t mean that the sidespin or interference, all too often associated with plastic and wooden tees, can be eliminated. 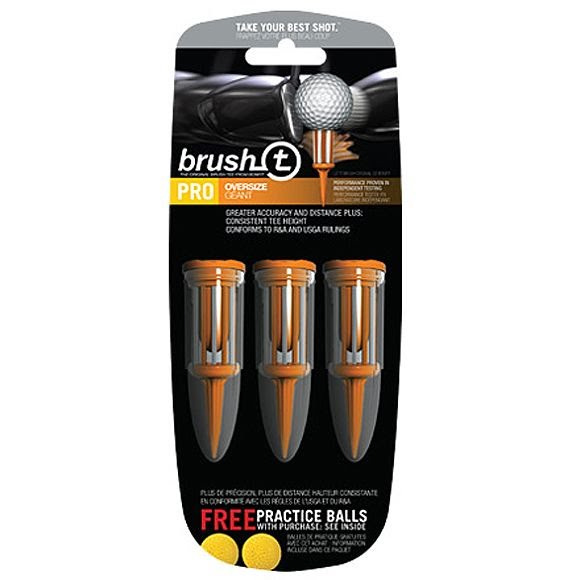 The bristles provide raised support of the ball, but still give unprecedented flexibility. Independent testing using a mechanical driver showed a marked improvement in the dispersion rate at impact, thereby delivering greater accuracy. Each Brush-t comes with the Brush-t, ball marker, bristle preserver, bullet shaped holder and belt clip. Measurements 3-Wood: 2", Driver: 2.2", Oversize: 2.4"